Note: this is no review as we already have one of those. After finally having an opportunity to dedicate some time to The Witcher 3: Wild Hunt, I can see now that I’ve not only neglected a cracker of a game but perhaps myself for not finding an opportunity sooner to play this. It really feels like CD Projekt RED have taken the best of BioWare and Bethesda games (and of course their own), to engineer something that it not only deep and complex but quite possibly one of the best games in its class. But I’ve still got a while to go before I can really be sure… I’m certain to have barely scratched the surface in the last ten hours of play. But I can at least share some impressions with everyone from what I’ve seen so far during Geralt of Rivia’s last adventure. 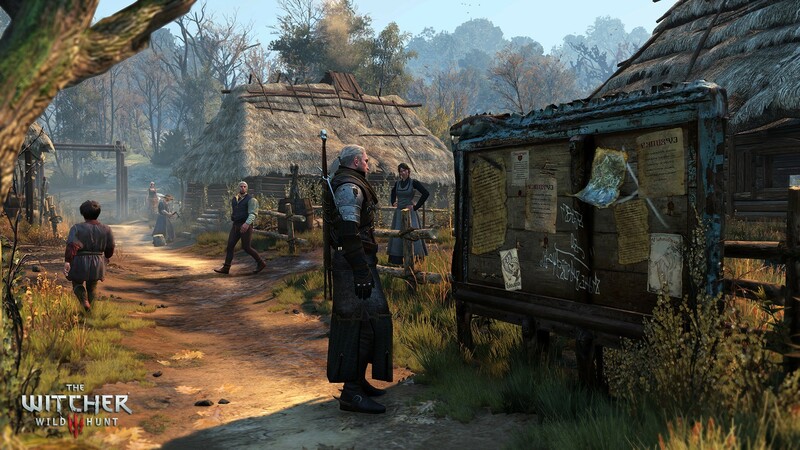 Even though the early parts of the game beyond the Witcher castle play out almost like an extended tutorial (the Griffin hunt), if you venture outside that quest path you can be inundated with side quests that you are just not ready for. The amount of opponents early on that will outclass you is huge and can be a daunting proposition. So it may be wise to play it safe and follow the main quest line until you rank up a few experience levels and then begin to tackle the side quests. Might be wise to keep away from the notice boards until you gain some experience. Early on you’re going to get your backside kicked a lot but if you can build up your potion making skills quickly you can at least keep yourself in the fight a little longer. And with the right combination, you can double the speed of your health regeneration which is massively useful. In conjunction with this, learning to use meditation (for health recovery) after battle will have the added bonus of recovering any potions used in battle (as long as you have enough hard liquor in your inventory). One of the early stages in the main quest line involves meeting up with a character known as the Bloody Baron. Initially you might think it’s going to amount to a fetch quest that will provide information as a reward and you’ll be on your way. But the further you play through it the more you realise there is a hell of a lot going on here and you have a lot to do. I was really impressed with how this played out and that there is a lot of depth to the storyline. Not only that it is a nasty tale that will likely make you change your opinion of characters constantly as the details become clear. That such a detailed side plot exists within the main thread goes far to establishing the world Geralt exists in. Remember in the Grand Theft Auto games how you get to a point in the game when cars are just a (virtual) phone call away? CD Projekt RED have literally created the same here but in a fantasy setting; a double tap of the thumb stick and Geralt whistles for his horse Roach. The best part is that Roach is available right from the start of the game which makes travel far more enjoyable and unless you are in a rush, less reason to use the fast travel signposts. 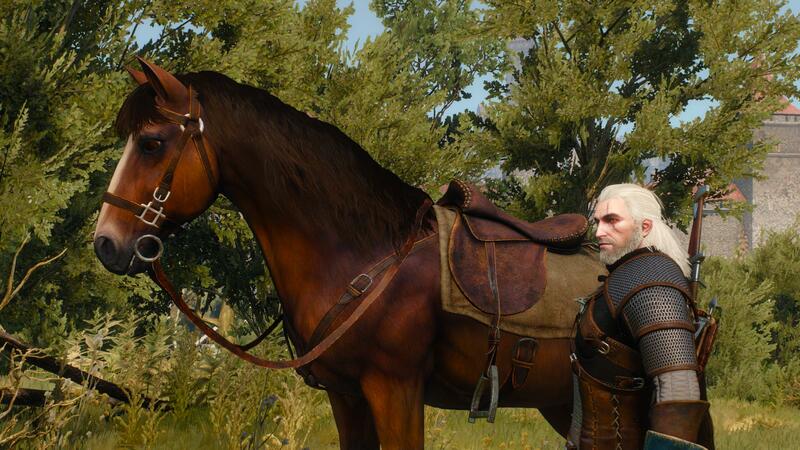 Meet Roach – the BEST HORSE EVER. One of the recent updates to the game introduced the concept of a “stash” to the game, allowing you to store items in a chest that is accessible at various locations across the game’s map. It may not be altogether realistic but it’s a welcome convenience that means items that may not be immediately useful (such as higher level weapons and armour) can be put aside and not sacrificed when your inventory is full. And that’s not the end of it; even taking into account the myriad of fixes to the game, enhancements are coming through to ensure the game is the best it can be. The same dedication was also applied to the previous games in the franchise so I suppose no one should be surprised but it’s still great to see.